With a heart condition and a grandmother to care for, Brittany Lundquist had a lot to overcome in her academic journey. She didn’t let these obstacles stand in her way. Lundquist had her mind set on being a positive role model for her brothers. Given her health, Lundquist knew the only way she could go to college was to go online. Still, being able to attend her graduation ceremony was very important to her. 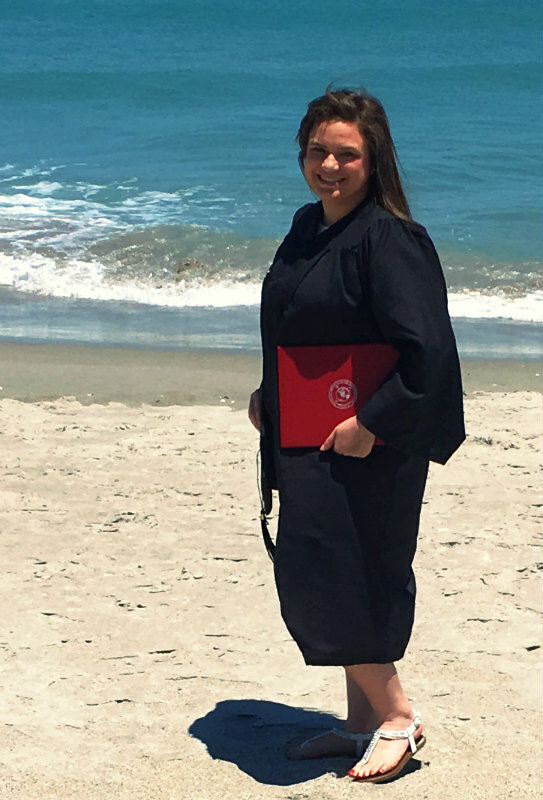 With Florida Tech, she was able to earn her degree online and walk across the stage with other main-campus and online grads. Let’s hear more about her experience at Florida Tech. I have had a medical/heart condition since I was about 15 years old. It truly has taken over my life. My medical condition isn’t life threatening – it is just life consuming. Everyday tasks are ten times as hard for a person with postural orthostatic tachycardia syndrome (POTS). When you stand up from a sitting position, your blood flow goes to your legs not your brain. You don’t get enough oxygen, and this can cause you to pass out. So, I have lots of fainting episodes. I chose online school because it was easier with my health. I am a volunteer cheer coach, and I also help take care of my grandmother. It is not easy living with a heart condition, going to school, youth cheer coaching and helping my grandmother, but I make the best of it. I wanted to show my two younger brothers that anything is truly possible if you do your best and never give up. When I was looking for a college, I knew with my health at the time that I was going to have to attend online. All I could ever imagine was graduating on a stage at the college that I went to: graduating with other students that worked as hard as I would to get to that point. When I found Florida Tech, I saw that they had an online program, and when I talked to a representative, he said that you have the choice to walk at graduation in Melbourne. Therefore, I chose Florida Tech. I also wanted to be an example for my two younger brothers. They both saw me graduate high school, and I wanted them to see their big sister walk the stage at her college graduation; to show them that hard work truly pays off. When I took that stage in May 2017, that was the happiest moment of my life. Having both my brothers and father there meant so much more to me. There were a few things that surprised me with taking an online program. Before I attended Florida Tech I had no prior online program skills, but Florida Tech helped ease the process. I was very surprised on how many online resources there were, and that the professors were very involved with our courses. One other thing I was surprised about was the discussion board – that was probably my favorite part. I loved that even though everything was online that we could talk to other students with the discussion board. Why did you want to study criminal justice? There was this girl I knew in high school that was killed in broad daylight in my town. It was a gang-related shooting; her boyfriend was in a gang. She just happened to be there. Wrong place, wrong time. She was going to school, she was the first person in her family to graduate from high school, and her life ended very soon. That motivated me to get my degree in criminal justice. I wanted to be involved in something crime-related, to help our town and to honor her. My favorite classes were all the crime-related courses. The reason the crime courses were my favorite was because they were all different, and I gained knowledge from each different crime course. How will your Florida Tech degree make a difference in your life? My degree in criminal justice has already made a difference in my life. With the knowledge and everything I’ve learned from Florida Tech, it helped with my communication, it helped with my writing skills, it helped with everything, honestly. My degree has opened my eyes to many possibilities. Whether it is understanding other people’s stories without judging them to knowing how different scenarios play out, I have a better understanding of the criminal justice world. I also have high respect for our men and women in blue. I did before, but now I know there is so much more that they do that citizens don’t realize. They put on their badge every day, walk out the door and kiss their loved ones goodbye not knowing if they will return that day. I learned that there aren’t just police officers; there are many other important jobs in the criminal justice field, and hoping one day that I will be able to work in that field. The most challenging part of my student journey was going to school and living with a heart condition. It took me five years to do a two-year program. But I did not give up, and that is the big thing. And that is why I encourage others to never give up on your dreams. Whatever it is, whatever life puts in your way, never stop going. It was truly worth it, in the end. There are four people that inspired me to succeed: my grandmother, my youth cheer team that I coach for and my brothers. My grandmother always stated how important college was in her family. She never said, “Are you going to college?” It was always, “What college are you going to?” She went to Wellesley College, so she had high expectations for her grandchildren. I was her first grandchild, so I knew she expected a lot from me. I did take my first year out of high school off due to my medical issues and helping my grandmother out (she had fractured her hip). Then March of 2012, I was finally ready to start my college degree. I am also a youth cheer coach and those little girls motivated me into finishing my degree. They motivated me into wanting to be in the criminal justice field. Whether it was crime scene investigation, forensics or working in the courts, I wanted to be a part of it. The two other people that inspired me to get my degree are my two younger brothers, Robert and Erick. They flew to Florida with me to see me graduate. I remember how excited my little brother Erick was when he got to see me graduate high school. I wanted to make sure he knew that anything is possible when you work hard and do your best. When I told him he was going to watch me graduate in Florida, he was so happy. I wanted to show my brothers that education is a very important part of life and that a college degree will further their knowledge and shape them into being a stronger person. I wanted to be that big sister, a role model, a leader to them. I know that they look up to me and I wanted to be that positive role model in their life. I wanted them to see that whatever life may throw your way that if you work hard, don’t give up, that you will accomplish anything you put your mind to. My next step is to further my education. I want to get my BA in Criminal Justice. With my heart condition, it was really rough going to school even online, but I would love to go back to school to continue my education. In the meantime, I will continue to battle my health, and when the time is right, I will return. The advice that I would tell students that are considering in enrolling is GO FOR IT!!! You truly never know how much you are going to like the program if you don’t try it.